The Recipe Swap - take a recipe from a hymnal recipe book and make it your own updated version by changing at least 3 ingredients - sounds right up my alley. 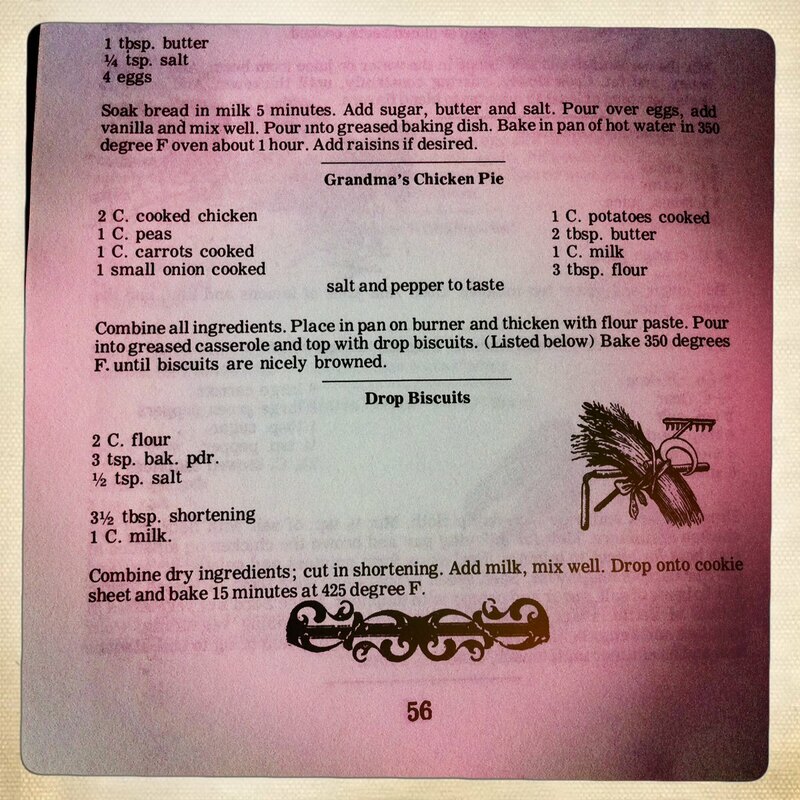 The recipe book (Alfred Brumley's All-Day Singin' and Cooking on the Ground) is from the days when exact measurements weren't needed. A pinch of this, a pinch of that and bake till it's done. I personally love the generality of this type of written recipe because truth be told, it's how I cook. I've had to learn to write measurements down and it's always not always easy. The Recipe Swap is a brilliant idea from fellow blogger Christianna at Burwell General Store and I'm thrilled to be a part. 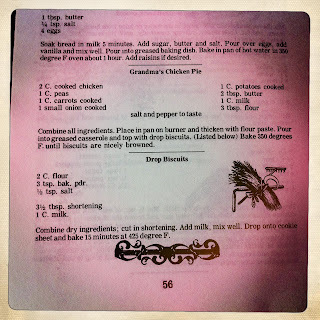 The chosen recipe is Grandma's Chicken Pie and Drop Biscuits, so essentially two recipes are in play for this swap. My inspiration to affect Grandma's Chicken Pie came from a classic BLT sandwich. With bacon added to the pie portion, swap the chicken for turkey since we don't eat chicken, mustard greens take the place of the lettuce and oven-roasted thyme tomatoes on the side take on the bulk of the BLT sandwich flavor. Taking change a step farther, I opted to create a sauce from champagne; it's a fun and lightly sweetened twist that marries surprisingly well with bacon (think hangover breakfast with mimosas). For the biscuit topping, adding a hint of lemon and brie lighten up a typical heavy-laden topping and are ever so faintly reminiscent of a lightly toasted brioche bread with mayo. It's a hearty, warming, fat and happy comfort meal to be enjoyed now before spring has us all looking for lighter fare. Below I've listed the gang of fearless food blogger participants, please visit their sites to see their take on the chicken pie recipe; and if you listen closely...very closely, I'll bet you can hear the singing in the background. Chop 3 slices of bacon, cook in a large saucepan until nearly desired crispness is reached. Add in the onions, celery, carrots and dried thyme and saute over medium heat until the onions just begin to soften, about 7 minutes. Add in the mushrooms and cooked turkey, saute another 5 minutes. Pour the champagne into the pan and let that simmer for a minute. In the meantime,thoroughly mix the butter and flour together (use a fork or just use your fingers.) Add the butter flour mixture and the cream to pan. Simmer the whole batch until the sauce begins to thicken, about 5 minutes. Place the chopped mustard greens and fresh thyme on top, remove from heat. Pour the bacon-turkey mixture into a casserole dish. Top with the lemon biscuit mixture (below). Bake at 375 degrees for about 40 minutes; the biscuits will become brown on top and the creamy mixture will be bubbling on the edges. While the pot pie is baking, fry up the remaining 2 slices of bacon and crumble. To serve, place a scoop of the BLT Pot Pie on a shallow bowl, add a couple of roasted tomatoes and top with the crumbled bacon. Sift the flour into a large mixing bowl. Add in the lemon zest, sugar, salt, baking powder and soda. Cut the chilled butter into tiny cubes and add to the flour mixture. Using your hands, mix the butter into the flour until pea-sized are formed. Chop the brie cheese, as well as you can chop a very soft cheese anyway, add to the flour mixture and toss. Slowly drizzle in the buttermilk a little at a time; depending on the humidity of the day, you may need slightly more or less liquid. Using your hand, lightly mix the dough just until it comes together; the dough should be somewhat crumbly rather than one big wet ball. Line a small oven pan with tin foil. Lay the tomatoes on the foil and drizzle with the olive oil,lightly toss the tomatoes to cover with the olive oil. Sprinkle the thyme sprigs over the tomatoes. Place in the oven along with with the pot pie (@375 degrees for 40 minutes), bake until the tomatoes just begin to burst. Remove from the oven and sprinkle with flaky salt. Ok my mouth is totally watering after reading your post and every single ingedient to imagine this. I, like many culinary lemmings, easily fall prey to the wiles of bacon and when I read your inspiration for your redo I was smitten. This is genius. Bacon, champagne, 'lemon brie'...incredible. I'm not a biscuit eater but now I have a few recipes thanks to the swap. So glad you joined in! Look forward to reading more. You had me at bacon and champagne. In every paragraph, there's something amazing that I want to eat, right now. Thanks so much for participating, I hope to see you in the next recipe swap! you really out did yourself with your version of the old-time chicken pot pie! Turkey and bacon got my attention right away but I think that topping really did the trick, and is roasted tomatoes just added one more dimension to the meal. Great job on your recipe redo! Love everything you did with this, but in particular the Lemon Brie biscuits sound amaaaaaazing. So glad you're part of this swap. I wish I could taste yours! Looks so fab. This is over the top! 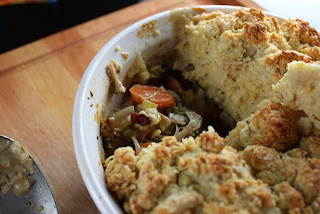 How fun- the perfect brunch casserole and of course, served with more champagne! What an inspiring recipe! The flavor combinations are magnificent! bacon, thyme, tomatoes, mustard greens, champagne...you have me! You certainly put a lot of thought and effort into this recipe swap and I'm inspired by it. Glad to be part of this swap with you Monique!